Tom Taylor has spent his entire life as a hostage to his father’s literary legacy. Wilson Taylor’s wildly successful 13-volume series chronicling the adventures of a bespectacled boy wizard named Tommy Taylor made him the most popular author on Earth—and destroyed his son’s future. On the day that the 13th title was published, Wilson vanished, leaving young Tom alone beneath the shadow of his famous namesake. Years later, Tom is still struggling to build an identity independent of his magical doppelgänger when disturbing new questions about his childhood suddenly arise. These revelations cast doubt upon his heritage, his memories—his very existence. Is it possible that nothing of his own past is actually true? That he is merely his father’s imaginary character somehow brought to life? Desperate to disprove this horrifying idea, Tom embarks on an epic journey that takes him and a strangely improbable group of companions around the world and deep into the realms of fiction—all while being hunted relentlessly by an ancient and sinister power determined to bring his story to a premature end. 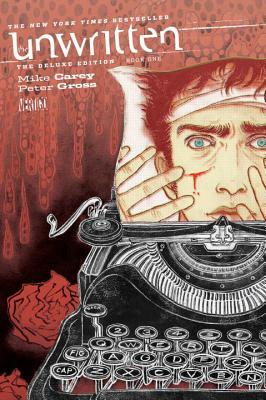 Mike Carey and Peter Gross’ masterpiece of metatextual storytelling is presented here for the first time in six definitive hardcover volumes. THE UNWRITTEN: THE DELUXE EDITION BOOK ONE collects issues #1-12 of the acclaimed Vertigo series and features a special behind-the-scenes section from Gross, Carey and cover artist Yuko Shimizu, as well as a new introduction by series editor Pornsak Pichetshote.